Visitors to Ruidoso, New Mexico have plenty of different activities to choose from while they’re in town, and if you are someone that loves spending time in the great outdoors, there are plenty of options for you to choose from. If you love exploring your natural surroundings on vacation, consider visiting the Grindstone Lake & Trail Systems located within Lincoln National Forest. This natural beauty offers tons of adventure and is less than 5 minutes outside of Ruidoso. Being just a short drive away from Innsbrook Village Country Club and Resort, it is a must-see. We’ve compiled a rundown of what you’ll see and what you can do at Grindstone Lake & Trail Systems from hiking, biking, swimming, kayaking, fishing and so much more. The Grindstone Lake & Trail System, completed in 2014, consists of 5 trails that totals about 18 miles long. Even for the most voracious hikers, there’s miles of different trails to keep you busy for a couple of days! 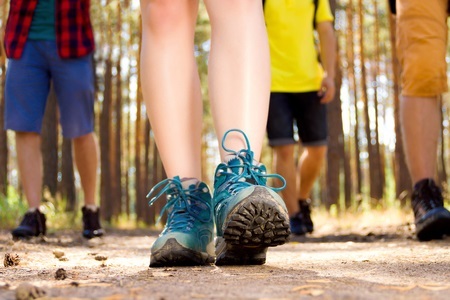 Whether you’re looking for a challenging hike to get in a workout or you’re in the mood for a leisurely stroll across the mountain side, there’s a hike level for everyone. With well-maintained trails and plenty of wildlife to observe, trail options are plentiful. According to Discover Ruidoso, you may even see black bear, deer, elk, blue heron, and bald or golden eagles, depending on the time of year! If you have a need for speed, bring your mountain bike along or consider renting a set of wheels to mountain bike on several different available trails. When you need a break, consider taking a picnic lunch at a scenic stop and enjoy the views. When you’re ready for a break from the bike, check out the viewing platform located above the lake to take in some wildlife: you can usually see birds feeding throughout the forest from the viewing platform! We’d encourage you to set off on a horseback riding adventure through Grindstone Lake and experience it in a unique way. Make sure to stop a few times along the way to enjoy the scenery and allow your horse to rest. Take in the beautiful surroundings while horseback riding is a great way to spend the afternoon. Non-motorized boating is allowed on the lake year-round so strap your kayak or your canoe to the car and come visit us. You can also purchase a boating permit online for a small fee and spend the day on the lake. Don’t forget to bring the paddleboard with you! Lakes are actually a great spot to learn to paddleboard because there aren’t any waves to knock you off your balance and the lake is fairly shallow. Speaking of fishing, Grindstone Lake is regularly stocked with rainbow trout, catfish and sometimes smallmouth bass. Between dawn and dusk the lake has prime fishing conditions. You can teach the kids to fish and relax for the day. Come by during the week when there are plenty of hungry fish just waiting to be caught, especially with motor free boats. If you want to take full advantage of Grindstone Lake’s shore, spend the afternoon with the kids swimming right in the lake and soaking up the sun. There won’t be a lifeguard on duty so make sure to keep an eye on the kids and stick to shallow water. However, nothing can beat swimming in a beautiful, clear lake surrounded by a stunning forest. If you’re a golfer and can’t get through a vacation without doing a few holes, you’re in luck: Grindstone Lake is home to a 27-hole, 81 par golf course that is heavily wooded. In fact, the annual New Mexico Disc Golf Championship is held on this very course. Don’t forget that at Innsbrook Country Club and Resort, we have our very own 9 hole, par 3 walking golf course! Great for a short game of golf and will still challenge even the most experienced golfers. Check out Trip Advisor for recent reviews of Grindstone Lake & Trail System. It’s just one of the many incredible places surrounding the Innsbrook Country Club and Resort. Interested in visiting Grindstone Lake & Trail System and looking for a place to stay, contact us today.